As regards book binding, King Matthias’ library in Buda had shown a diverse picture. The Royal Library included books bound in a variety of covers including silk, velvet and leather. By now, the picture has become all the more complex. During the past more than five hundred years, layers of damages and repairs have been stacked on one another on the book bindings. Changes made to the bindings occasionally highlight the given period, or the possessor; in some cases, they had become an integral part of the book. After having been taken away from Buda, a new binding was added to some corvinas, for example, in Vienna (OSZK, Cod. Lat. 413., Cod. Lat. 421., Cod. Lat. 423. ), Istanbul (EK Cod. Lat. 1-13) and Modena (OSZK, Cod. Lat. 346., Cod. Lat. 347.). Even in the 15th century, a book could become part of Bibliotheca Corvina in a number of ways. 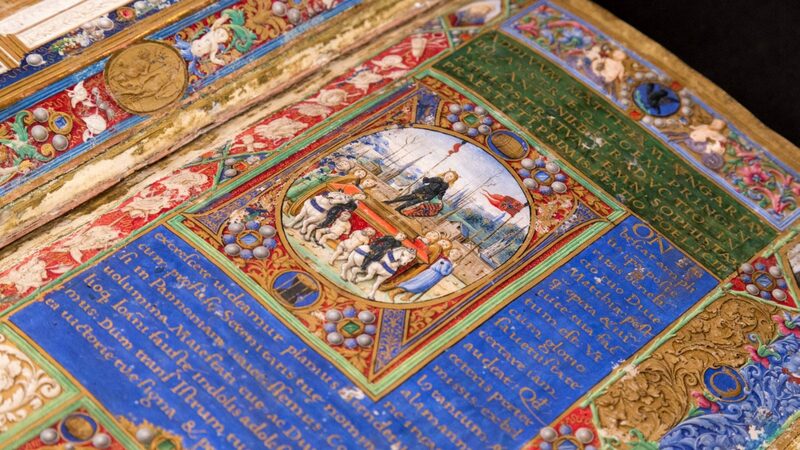 Added to the Royal Library were items that had already been bound, and books featuring elegant, Italian Renaissance binding decorated with blind-tooling and leather onlays (e.g. OSZK, Cod. Lat. 415., Cod. Lat. 418.). But corvina codex has also survived in a simple, everyday undecorated period leather binding (OSZK, Cod. Lat. 426.). And books had been bound and re-bound in the bookbinding workshop located in Buda. Excavation finds of Buda Castle and traces referring to production technique, detectable in certain book copies, show clear evidence that there had also been re-binding activity in the Buda workshop. According the division made by Theodor Gottlieb in the early 20th century, corvinas can be divided into ones with cover decorations featuring emphasized central panel, five-circle, allover or architectonic design. Gottlieb, Theodor: Bucheinbände, K. K. Hofbibliothek, Wien, 1910. However, the so-called emphasized central panel design had been the generally used, characteristic decoration; examples for the other types can be found only rather scarcely (five-circle decoration: Budapest, OSZK, Cod. Lat. 345., Erlangen, Universitätsbibliothek Ms 6; allover design: Stuttgart, Württembergische Landesbibliothek Cod. Theol. Phil. fol. 152, Vienna, ÖNB Cod. 2271; architectonic decoration: Vienna, ÖNB Cod. 656, Västerås, Stifts- och Landsbibliotket, Ink. 21). Emphasized central panel design fits in the trend of book history, if we consider central layout as one of the key elements of the transition from Gothic binding decoration into the Renaissance one. In the collection of National Széchényi Library, eleven of the twelve original leather corvina bindings made for King Matthias feature emphasized central panel design. Corvinas made in the royal bookbinding workshop of Buda had been bound in full leather, painted red. Bookbinding leather had been made of goatskin. Spine decoration of the leather-bound corvinas was more simple that the decoration used on the boards; the spine had merely been decorated with blind-tooling. Triple lines divided the spine fields into diamonds, and one five-, or six-petal rosette had been tooled into the diamonds, respectively. Board decorations, however, were considerably richer, featuring an accurately designed composition. The bookbinder had ruled auxiliary lines in order to create a precise decoration; these lines are sometimes visible at the center-point mark, at the double-circle row, or at the letters. The composition is symmetrical axially, and very often even centrally. From the coat-of-arms and the crown above, as the center, rows of point-to-point identical plant motifs start off into four-six directions. The specialty and uniqueness of corvina bindings lies in their rich gilding, on the one hand, and in the motifs used for decoration, on the other hand. Various types of graceful tulips and a variety of plant motifs had been created by pressing the single tools into the leather. A characteristic feature of the bindings is the use of disk-shaped gilded and painted leather onlays. Unique is the elegant method of fixing the strap and the clasp; not even the Italian bindings, serving as a model, had featured such solutions. On the corvinas, straps and clasps were fixed on the wooden boards, and only then was the cover leather pulled on, so the elements are not visible and, consequently, they do not break the unity of decoration. At the same time, on period Italian bindings the straps had been fixed with pierce-through nails, and the right board had usually been mounted with trefoiled clasps, which can also be detected on undecorated velvet-covered corvinas (see OSZK, Cod. Lat. 234., Cod. Lat. 241., Cod. Lat. 281.). Single tools applied in the Buda workshop of the Corvina Library during King Matthias’ reign were not used any more after the king’s death. However, the motif set continued to be popular. Various re-engravings of motifs such as tulip and leaf variations, calyx flower, knotwork pattern and double circle can be found on royal bindings made for King Ulászló II, as well as on orders placed by magnates. There had been keen efforts to produce bindings, featuring similar compositions as the ones made for King Matthias. Various ornamentations of similar form can be detected on bindings made in the first half of the 16th century, in the period of Hungarian bookbinding art going back to the roots of the Italian Renaissance, which period was ended, once and for all, by the Siege of Buda in 1541 leading to 150 years of Ottoman control of Hungary. According to recent research, the last years of King Matthias’ reign witnessed the most significant expansion of his library, and it was at this time that the king’s library had become part of royal representation. The expansion and development of the royal library was supported by the copying, book illuminating and bookbinding workshop set up in the royal court of Buda. Uniform binding types of the royal library had also been created there. No data have survived about the workshop, but most probably one or more bookbinders, who had been either Italian-born or had studied in Italy, worked there. Technical solutions of the bindings also suggest that the bookbinder(s) was/were of Italian origin. During the short period of the workshop’s operation, lasting no more than a few years, only part of the volumes had been provided with the characteristic gilded, leather corvina binding featuring onlays. This hypothesis is justified by contemporary, but not corvina bindings originating from the Corvina Library (for example, OSZK, Cod. Lat. 344., Cod. Lat. 415., Cod. Lat. 418., Cod. Lat. 426.). Over two-hundred volumes are known to have survived from King Matthias’ scattered library, some forty out of which feature the characteristic leather corvina binding. Twelve of them can be found in the collection of National Széchényi Library. Not only leather, but also velvet and silk bindings had been made for King Matthias. National Széchényi Library does not own any silk-covered corvina, and there are only four velvet-bound corvinas in its collection. During a recent survey of the corvinas kept in NSZL, we could tackle only a fraction of the onetime, and even of the surviving bindings. In spite of that, the outlines of a binding type come clear out of the bits and pieces of information. Roots of the characteristic leather corvina bindings can be traced back: elements of both their binding and decoration techniques can be detected on Italian Renaissance bindings. However, a definitely separable group of bindings, featuring spectacular design, had emerged out of these elements. Binding technique of the codices is not entirely uniform: several slight alterations and variations can be detected on them. Alterations are due to the time gap between bindings, or probably to differences in the works of several bookbinders operating next to each other. Following the steps of bookbinding, the characteristic features can easily be defined. First of all, endleaves were made to the quires arranged in order. Endleaves are the most vulnerable parts of the books, consequently, it is often rather difficult to specify their original structure. On the corvinas, endleaves are usually formed by one-fold sheets, sewn to the quires, and the external or both leaves were trimmed undersize in relation to the textblock. In some cases, leaves of the last, not entirely entry-filled quire of the codex functioned as endleaves. Endleaves are not pasted onto the board as a pastedown, and probably they had never been, in most of the cases. Traces of pastedown of the original endleaves can be detected only in one of the corvinas owned by NSZL, on the binding of the codex shelfmarked Cod. Lat. 241. The books were sewn all along double, white leather sewing supports with kettle stitches. Endband cores, also made of leather, were attached to the textblock in a separate session, in a way that tiedowns were made in every gathering with the sewing thread above the kettle stitches, leaving out an approximately one-centimeter section. In most of the cases, endband cores were also made of white leather straps, but the binding of the codex shelfmarked Cod. Lat. 345. features a reddish brown leather endband core. The spines of the books were lined with white leather between the sewing supports, above the upper sewing support, as well as under the lower sewing support. Lining fills in the compartments, but it barely exceeds the spine width. On the bindings that could be examined, attachment of the endband cores was made through lining. Embroidery of the endbands was made with colors, similar to the ones on the leather and velvet bindings, and with metal thread, but with different stitches. Green and flesh-colored silk threads and, according to an examination carried out in 1995, silver thread, gilded on one side, and wrapped around a yellow silk gut thread were used for embroidery. Compound endbands were sewn on leather bindings, while on the velvet bindings saddle sewing was applied. The compound endband of the binding covering the codex shlefmarked Cod. Lat. 345. was embroidered only with metal thread and flesh-colored thread. Decoration of the edges is also different in case of velvet and leather bindings. In case of leather bindings, the edge is gauffered and gilded on all three sides. The pattern of gauffering is often hardly visible, consisting of small, repeated motifs, arranged in several rows, or the ornaments take the form of a network of diamonds, with printed elements in its divisions. In case of velvet bindings, the edge is gilded, painted and gauffered, which is the so-called Buda-type edge. Painting is formed by flower garlands on gilded background, identical at the head and at the tail. Elements of the flower garlands were gauffered around, but gauffering also outlines new motifs around the painted elements. The fore-edge of the books features abbreviations of the author and the title, framed by a border, with flower garlands on its two sides. Titling suggests that the velvet-bound codices were laid on the shelves with their fore-edge turned outward. Feet of the letters of the titling, in a not uniform way, face either the left board or the right board. Boards of the examined bindings are made of beech wood, with wide book squares. On the inner face of the boards, there are internal bevels along the edges; the spine edge does not feature bevels, only in some cases, in a narrow width. On the outer face of the boards, steep external bevels can be observed along the spine edge in full thickness; on the other sides, the external surface is shaped with a gentle curve around the borders in the form of peripheral cushions. The curves were usually shaped by an irregular grating of the edges. In some cases, no peripheral cushions can be detected. Elaboration of the boards is different; there are boards, the surface of which is smoothly shaped, and there are others, displaying rough traces caused by tools. Sewing supports were attached to the boards in two ways: either laid in recesses running on the outer face of the boards, or led in at the edge of the boards and recessed into the level of the boards in a similar way. Recesses to accommodate the clasp straps and ribbons, fastening the books, were also formed on the boards, but no recesses were made for them on the edge of the boards. Recesses formed to accommodate the clasps of leather bindings on the boards were similar to those made to accommodate the straps or ribbons. A recess running along the external surface of the boards, starting from the corner of the board was formed to accommodate the endband cores. The sewing supports and endband cores must have been attached to the boards by using iron, wooden and copper nails, alternating even within one binding. Ends of the leather linings of the spine were pasted down on the external bevels of the outer face of the boards. The spine of the books could be straight, or shaped with just a gentle curve. Velvet bindings are undecorated, purple or red, the purple velvet features irregular dark and light purple, as well as pinkish shaded stripes. On the turn-ins of several books, woven edges of the velvet have survived (OSZK, Cod. Lat. 121., Cod. Lat. 234. ), the color and weaving of which refer to the quality of the velvet. Covering of the leather bindings is made of deep red goatskin; the color is a combination of the color of leather tanning and painting. Turn-in of the leather binding is irregular, featuring pared edge; mitered corners can be observed. On most of the boards, long extending trimmings indicate traces of trimming of the leather that had become superfluous during the formation of the corner. Corners of the velvet bindings are similarly formed. On the spine leather of the codices, sewing supports are doubled; on several bindings, traces of the fixation of the sewing support are visible. The sewing supports and their divisions are emphasized by the use of blind-tooled triple lines, which would not run on the surface of the boards, instead, they form part of the frame of compartments. Similar use of lines can be detected in the line of the endbands, too. The codices were fastened by four pairs of left-to-right fastening clasps. The clasps of the corvinas belong to the hooked clasp-type. As regards their form, the edge of the clasp on the board was re-bent on itself, and the catchplates on the strap or ribbon clung to the cylindrical protrusion created in this way. Clasps of the velvet and leather bindings were different, in spite of the fact that they belong to the same type. On the right boards of velvet bindings, out of the various forms of the clasp-type, only the trefoiled clasp can be detected in three versions. On top of that, forms can be different even within one binding (OSZK, Cod. Lat. 241.). On velvet bindings, ribbon straps fastened the books, but only fragments of the ribbons have survived; the clasps that had been on the ribbon straps were lost. The straps were fixed without a hold-down, with large, hemispherical iron nails. Straps on the purple velvet bindings were green, while on the red covers, they were burgundy colored. Clasps of unique goldsmith’s artwork were made for the red velvet binding. The clasps were made of silver, by casting; they were fire-gilded, and were present on both the left and right boards. The clasps feature the shape of two dolphins facing each other and surrounding a coat-of-arms. The coats-of-arms, also made on a silver base, were mounted on the clasps as inlays. The coats-of-arms were made with two types of illustrations: with the Corvine (raven) coat-of-arms of King Matthias, and the unified Hungarian and Bohemian coat-of-arms. Straps with metal seals on both ends are connected to the clasps on the left board with hinge. Barbs of the straps cling to the edge of the clasp on the right board. The dolphin shapes of the clasps and their painted, gilded enamel inlays show a striking resemblance to the ornaments visible on the foot part of the Matthias Calvary (Cathedral Treasury, Esztergom, LTSZ: 0033334). The clasp solution of leather bindings is characteristic of the corvina bindings only. The metal clasps on the board, featuring a simple shape, had been fixed to the recesses made for them on the board before the leather was pulled on, and they were covered by the leather that had been pulled on. Their whereabouts at the edge of the board was indicated only by a protrusion, to which the catchplate clung on closing the book. Thongs or straps had also been secured to the boards before the leather was pulled on, so their fixation is not visible on the cover. On leather bindings, both ribbon straps and fragments of leather thongs can be detected. Ribbon straps were made with card weaving, with in-woven pattern or with no pattern at all, eventually decorated with fringes in red, green and possibly bluish purple colors. Based on the remnants, the leather thongs were folded. In line with the type, the clasps that have survived on the strap or the thong were folded in half, forming a simple rectangle; they were only slightly decorated. Clasps were mounted on the straps with copper nails, while the clasps and straps were secured to the boards with copper and wooden nails as well. Traces of chain fixation can be detected on several codices. Form and size of the impressions are identical, but most probably the chains had not been mounted on the bindings in the Corvina Library; they must have been mounted on later, in another collection.